The above picture summarises chances of some thing happening from 'impossible' to 'possible'. The outcome of any of the above event is pure chances. It may happen or it may not happen. Do you notice the difference between first 4 statements and the last 2 statements? In case of first 4 cases, the result depends upon external factors such as place, time, strength of opposition team.. where as result of 5 and 6 will almost be same irrespective of place and time of the event. There are cases when outcome of certain events can be forecast with some certainty. One such event is tossing of coin. 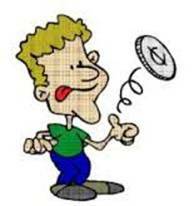 When we toss the coin there can only be 2 outcomes, either head appears or tail appears. When coin is tossed up several times obviously, the chances of head coming up can vary from 0% to 100% and tail coming up can vary from 100% to 0%. However when coin is tossed up in large number of times(in thousands) head coming up may be 50% and tail coming up could be 50%. In such cases, the probability is 1/2. Note that when head appears tail can not appear at the same time. Similarly when tail appears, head can not appear at the same time. This we say that events are exclusive. That is to say, there can not be any other possibility other than head appearing or tail appearing. In such case, we note that the sum of their probability is 1/2+1/2= 1. Note that probability is expressed as a ratio and it is always ≤ 1. why does dice have dots numbers from 1 to 6?. Note that dice is a cube and it has 6 faces. Hence their faces are represented by 1 to 6 dots representing numbers from 1 to 6. When a dice is cast what are the chances of a number appearing from 1 to 6? It is one out of 6 and hence the probability is 1/6. What is the sum of probabilities of number appearing between 1 and 6? (Note that, when one number appears when a die is cast, other number can not appear at the same time. Since probability of each number appearing is excusive of others, sum of their probabilities is equal to 1. Test or a procedure or operation which produces a result. In this lesson all experiments will be random. head or tail/ appearance of number from 1 to 6. When a die is cast the probability of getting a number > 0 and < 7 is 1. (Because when the die is cast the numbers got are always between 1 and 6). when a die is cast the probability of getting number <1 or >6 is 0. (Because this event will not occur at all). Here A and B are mutually exclusive, because either A occurs or B occurs. they do not occur at the same time. Can probability ratio be 0 or 1? 1. What is the probability of getting a number 0 or greater than 6 when dice is cast? 2. What is the probability of getting a number 1 to 6 when dice is cast? Problem 1 : A survey of 850 working woman showed that 158 used own four-wheeler, 416 used two-wheeler, and the remaining used public transport. If one is chosen randomly among these women, what is the probability of the woman who commute by (1) own four wheeler (ii) Own two wheeler (iii) public transport and (iv) own vehicles. Problem 2 : A box contains 12 balls out of which 'x' are red. (i) If one ball is drawn, what is the probability of getting red ball? Problem 3 : A game consists of rolling 2 dices. If the sum is 2,3,4,5,10,11 or 12, player A wins. If sum is other than these, then player B wins. Of you want to win, would you be player A or player B? Obviously Any one would like to be B. So, sum of the probabilities of all the elementary events of an experiment is 1. Note that chess board has 64 smallest squares. 2 squares can be got in 32C2 ways. 1 square can be got in 32C1 ways. Note that total number of people available to form the committee is 7. Remaining 3 members are to be women. Remaining 3 members are to be men. First we need to find number of committees that can be formed with 4 men. Remaining 1 member has to women.